The resort offers one and two bedroom suites. One bedroom suite (sleeps 4) has: one bathroom, queen-size bed, and a queen sofa sleeper. Two bedroom suite (sleeps 6) has: one bathroom, queen-size beds, and a queen sofa sleeper. 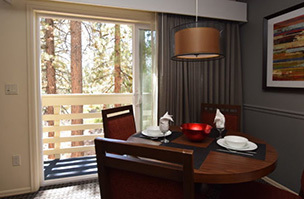 Each suite has a kitchenette, separate living area, fireplace, patio or balcony, DVD player, and cable television in the living room and bedroom(s). Maximum occupancy in each suite includes children regardless of their age. One car or standard truck per suite. The information provided is subject to change without notice and is merely provided for your convenience. Please understand this information can become dated and must be periodically updated.